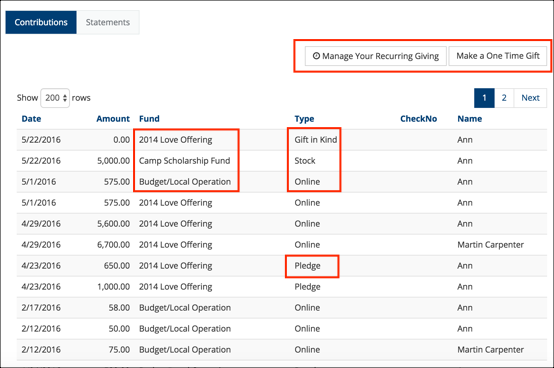 The Giving tab on a people record is where any user, including a My Data user, can go to print statements, make an online gift, manage recurring giving, change their Envelope or Statement options, or just monitor their giving. This tab has two sub-tabs - Contributions and Statements . Contributions tab This contains a list of all contributions for that person and/or their spouse, if they give jointly. If the church has online giving set up there will be buttons for Manage Recurring Giving and Make a One-Time Gift . These buttons are not visible to anyone but that individual. A Finance user can also click the amount , which will open Contributions Search . The search page will be filtered for that person for the year specified. This is the easiest way for the Finance user to access the Return/Reverse links. 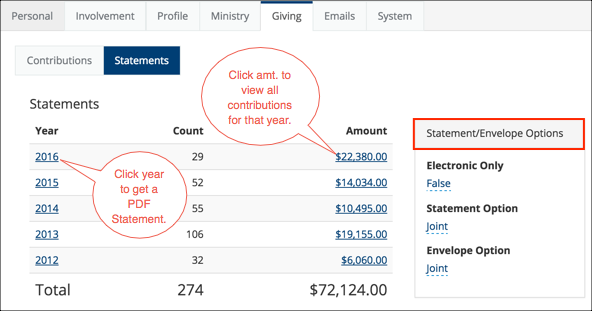 Anyone with a user account can go to his own record Giving > Contributions tab, click Manage Your Recurring Giving , and then click the Stop Recurring Giving button at the bottom of that page. This will cancel their recurring giving and stop all future payments. If a donor does not have a user account, he can go to the church’s website (wherever you have posted your online giving links), click the link for setting up recurring (managed) giving, and be sent a one-use link. That link will take him to his recurring giving page, where he can click the Stop Recurring Giving button. A user with Admin and Finance roles can cancel a donor’s recurring giving by going to Administration > Contributions > Management > Managed Giving and click the Delete button beside the donor’s name. This will cancel that person’s recurring giving and stop all future payments.